I know that I've been quiet for a couple weeks now, but there is a reason for that. You, my dearest clients, have been keeping me busy! I am so thankful for each and everyone of you. I am also very excited to tell you, that after living in North Carolina for 3.5 years,one of my struggles is over: I have found products to use without consuming all those 2000 toxic ingredients that are banned in Europe, but allowed here in US. That also means that I have brought my skin care products from Finland, since in Finland you can count that if it says 'Organic' in your product, it also means 100% organic. That, by the way, is not the case here in US. Here you can call any product what ever you wish and you need to be a detective to understand what is hidden in your products. For example under the label fragrance, are hidden so many toxic and harmful chemicals that are linked with birth defects, breast cancer or other autoimmune diseases. Fortunately I had a chance to meet some awesome ladies who introduces me to a world of Ava Anderson! She is a young lady who founded this company carrying her name to help us stay free of chemicals and lower our toxic load. I ordered my skin care products immediately and just added a new order for my house cleaning, dishwasher and laundry products. This is so great; no more trips to Walmart but I get high quality stuff straight to my house! Are you as excited as I am? If you are, feel free to ask me more next time we meet! I will be having some products and samples in my office and I can order your stuff to you. I could also be presenting AVAhours at your house, but well... maybe that is not my way to do this. But I will definitely contact you to people who would love to come to have a presentation at your place. The best thing is, that in January 2016 I will add a new treatment in my services: completely organic and toxic free face, head and scalp massage! Awesome treatment to get out of that tension in your neck and upper body and activate lymphatic drainage in your face. In this treatment I will be using Ava Anderson -products to clean, hydrate and if you wish also exfoliate your face, but the massage is the thing that you want. I did these treatments back at home and now that I can count on these products, I am back in pampering my ladies! This 'Queen City Treatment for Awesome Ladies' will last about 30 mins and I'll charge $50. Is that a great gift idea to your friends and family or not? Gift cards are in sale from this moment and 2 lucky ones get a free sample, since I need test these products and procedures before January. Anyone? Contact me if you want to be my guinea pig... only 2 fastest one gets their free 30 minutes treatment! I am pretty excited about this, so stay tuned. 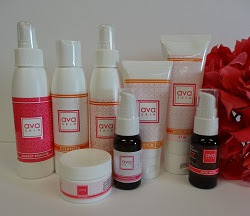 Introducing Ava Anderson Products will be one of our workshops at Ballantyne Chiropractic Wellness in the beginning of the year 2016. But before that, we have a Thanksgiving to celebrate to and also Christmas, my favorite time of the year. I will have reduced hours on Christmas time (I have visitors from home), so book your treatment or collect your gift cards sooner than later. If you are interested, check the link below.